By train, we’ve travelled from Gdansk to Krakow, from Krakow to Warsaw, and now we’re on the train from Warsaw to Berlin. In all, that’s some 1400 km. What is astonishing me is that the countryside is almost all the same. It’s flat, flat, flat. Long narrow unboundaried fields – and gosh, Polish cows don’t need fencing in – are interspersed with swathes of forest. No wonder that that throughout history, invading armies have been able to march unimpeded across the land, conquering as they went. Hitler’s tanks, Stalin’s tanks all had a pretty easy ride here. Just now, we’ve been passing through flatlands of long, wide peaceful lakes. And we’re drawing closer to Poznan, near to which my father was born, to a farming family. I feel surprisingly emotional. 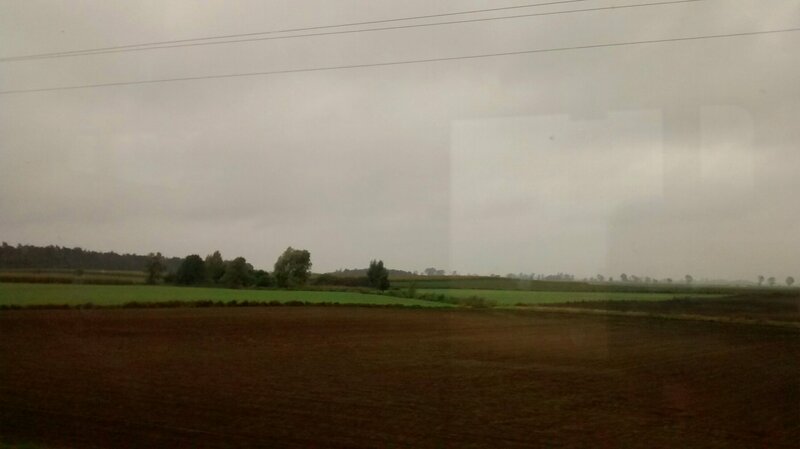 View from the train window, almost anywhere in Poland. From your photo it could be Norfolk or even Lincolnshire couldn’t it, but I suspect maybe on a larger scale? Oh, it’s just unending. I couldn’t believe how it went on and on. I’m wondering, is it naturally flat or been rendered so from all the invasions, bombings, destruction and levelling etc? Oh it’s natural alright. A huge plain extending from Poland through North Germany and to the Low Countries. Even our own East Anglia may have been part of it once upon a time. Your observations are interesting as always. What tales those fields could tell. Nothing like retracing roots to stir the emotions. Aboriginal Australians speak of ‘belonging to land’. I think we all have that sense of connection. I’ve finally begun to feel it. Travelling through the flatlands can be a little trying! Not for me as a permanent address though. I think so. It took a while, but I can certainly feel it now. Looks like the middle of America–we call it “flyover country” because it’s not interesting enough to drive through! It did go on a bit!